Analytics gives a thorough insight of all the statistical information about each clip in all publications within this portal. Selection by using the date quick selection (preset) tool. This can be used to select today, the last 7 or 30 days or the All time selection. To select current and previous years, hover over Select to see the years. This way it's also possible to select a month from a year. Selection by using the date selection tool. Pressing the left date will select the from data, while the right date will select the to data. This will change the graph screen and world overview as well, to reflect the selected from and to date. At the top right of the screen is a Publication tab which when clicked will show the publications that can be filtered on. Adding a line in the graph of a publication can be done by clicking on the button indicated by 1 in the picture below. Pressing that button again will remove the line from the graph. Selecting multiple publications will show multiple lines in the graph. Checking the checkbox indicated by 2 in the picture above will show the results for that particular publication in the graph as a colored line. 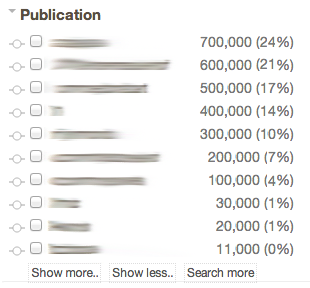 Checking this box will filter out all other publications except the publication(s) that is/are checked.